On July 5, 1983 Leatherman Tool Group, Inc. was officially incorporated based on a few simple principles: manufacture quality products that deliver excellent value to the consumer while providing good, living-wage jobs to the local workforce. More than thirty years later they’re still going strong in the U.S., in their home town of Portland, Oregon. Leatherman started with over 3,000 text testimonials. In their work with StoryBox, their goal was to transform these written testimonials into visual stories. The campaign they launched was called Tool Tales. Leatherman implemented a custom integration, where customers could create overlays on top of their video. 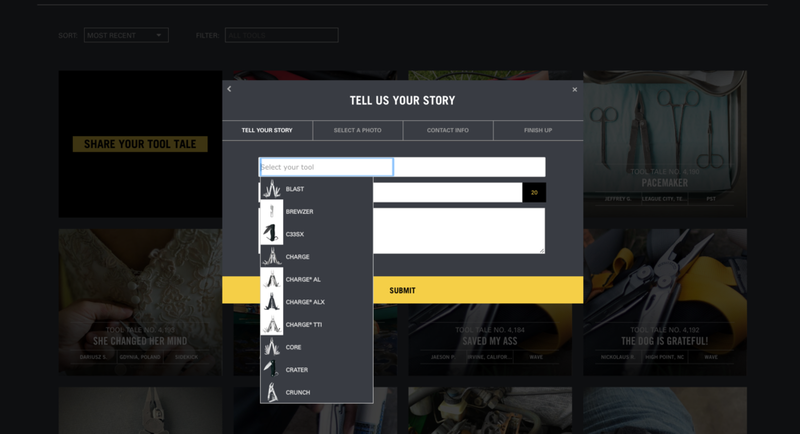 These overlays gave their Tool Tale a title, showcase more info about the customer (where they live, who they are, and what tool they're talking about), as well as assigning each Tool Tale a unique number. Customers could submit photo, videos, or text. They would select which tool they are talking about from a dropdown menu, so that Leatherman can make each tool shoppable within StoryBox's lightbox display units. The resulting display is breathtaking and extremely interactive. 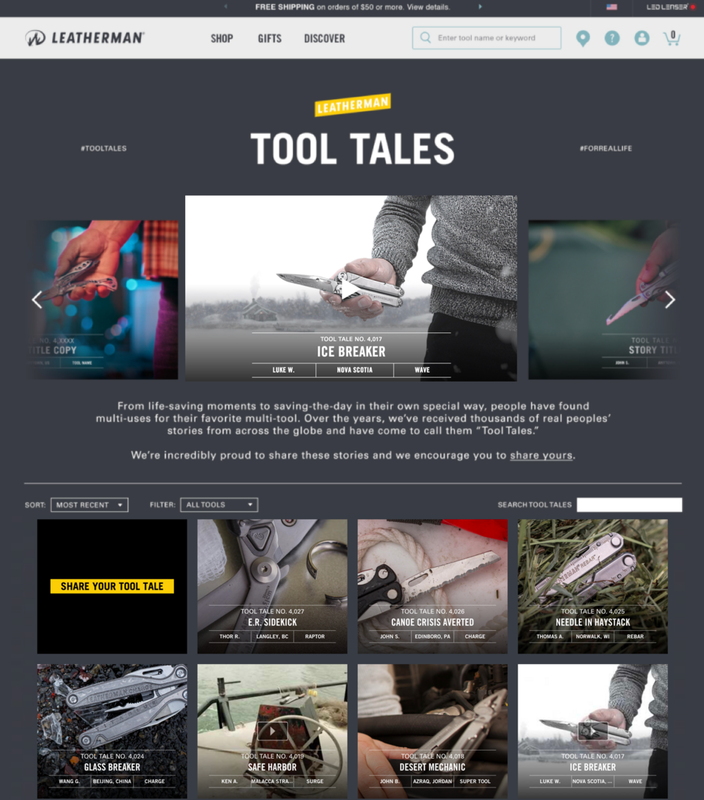 The Tool Tales Gallery features professional video content at the top page, along with customer generated photos and videos at the bottom of the page. Custom overlays help to tell the story, even at a glance. 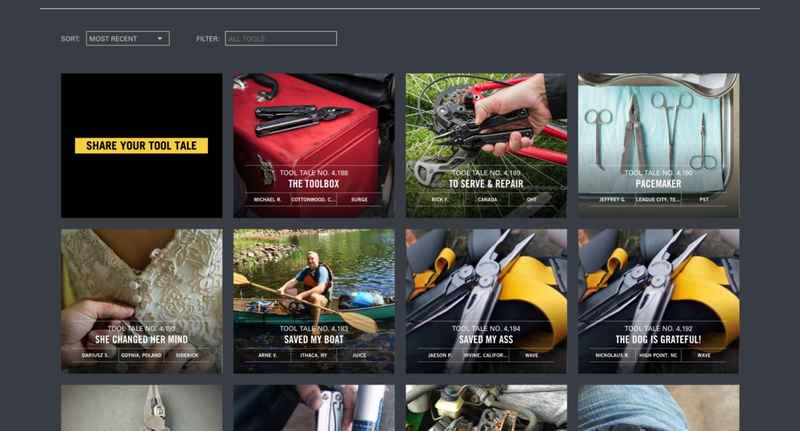 Leatherman wanted every customer to be able to share their story, however they would like. So they enabled photo, video, and text submission options to unleash their communities creativity. Each image and video is accompanied by a text story, as well as more information about the story's author (name, location, favorite tool, story title, and Tool Tale Number). To keep the gallery visual, when a customer submits a text entry, they can also select predesignated photos to accompany their tool of choice.